Download free printable valentines for kids. 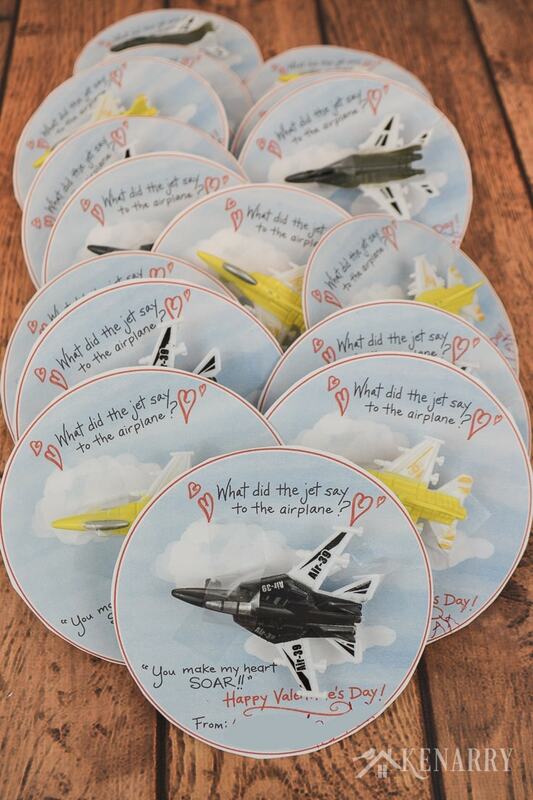 Your child will love giving these Airplane Valentine’s Day Cards to friends at a school party. Does your child love jets, airplanes or the Air Force? 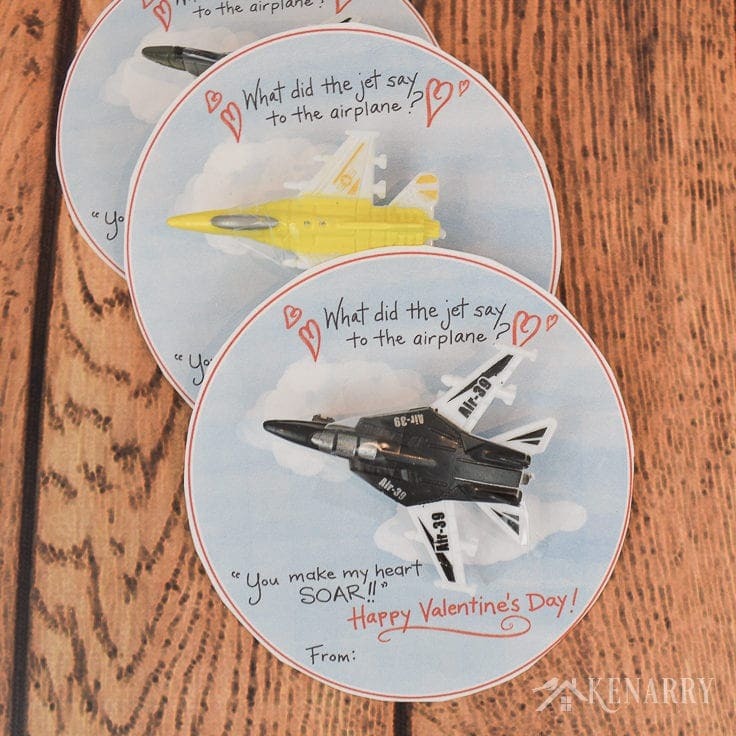 Then the free printable Airplane Valentine’s Day Cards we’re sharing today are the perfect cards for him or her to give out this year. 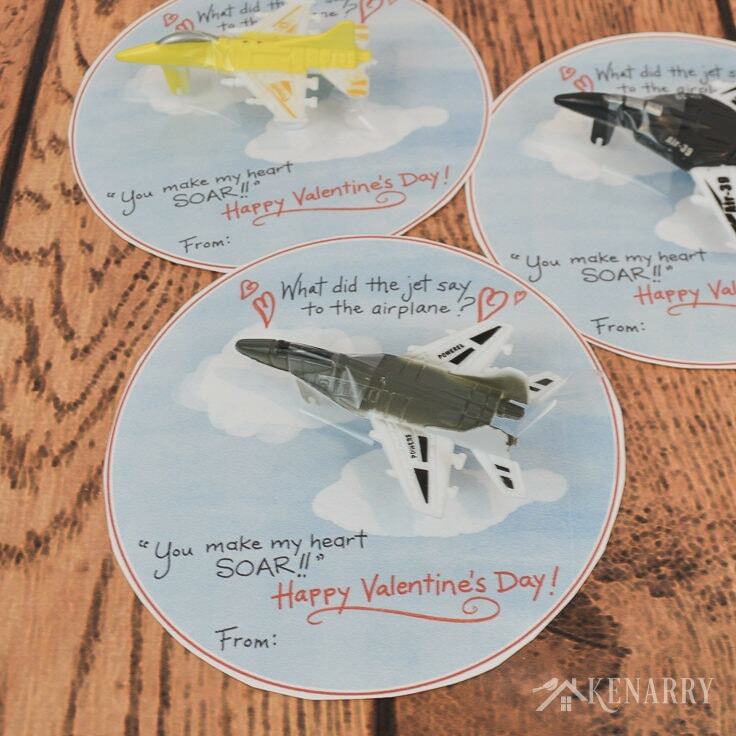 Just print the valentines, add a toy airplane and you’re ready to jet! If you’ve been part of our Idea Insider community for a while now, you know I love creating fun birthday treat tags and Valentine cards for my boys to give to their friends at school. When our youngest son who we call “C2” here on the blog was in 3 year old preschool a few years ago, I made him funny Knock Knock Joke Valentine’s Day cards. They even included super silly googly eye glasses that we found at our local dollar store. Then the following year when he was in 4 year old preschool, before we could design his Valentine’s Day cards, he was insistent that we had to find some sort of treat or trinket to go with them again. So of course, we headed back to our favorite dollar store and wandered up and down the aisles. What did the jet say to the airplane? 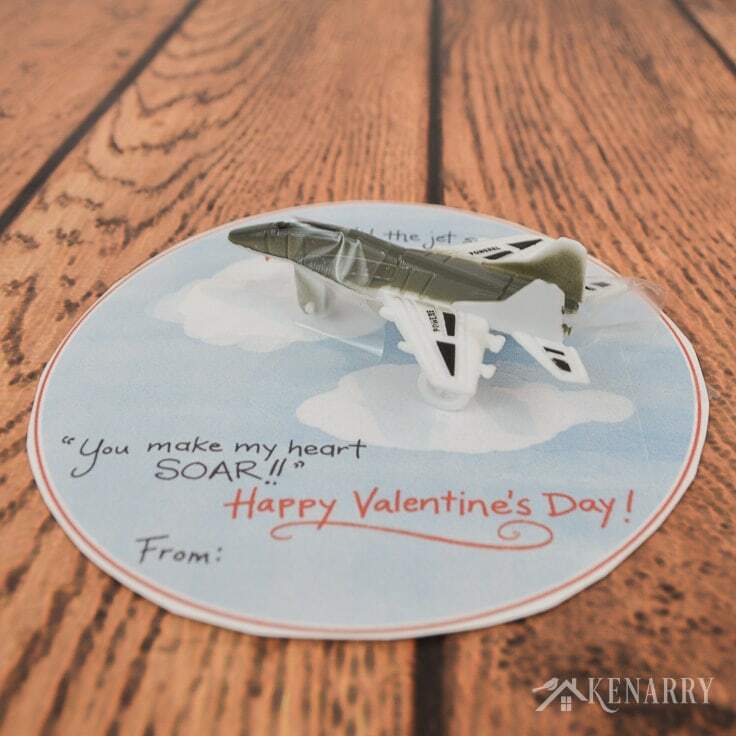 Your preschool or elementary child and his/her classmates will love this joke too so we wanted to make the Airplane Valentine’s Day cards available as a FREE digital download for Kenarry Idea Insiders. 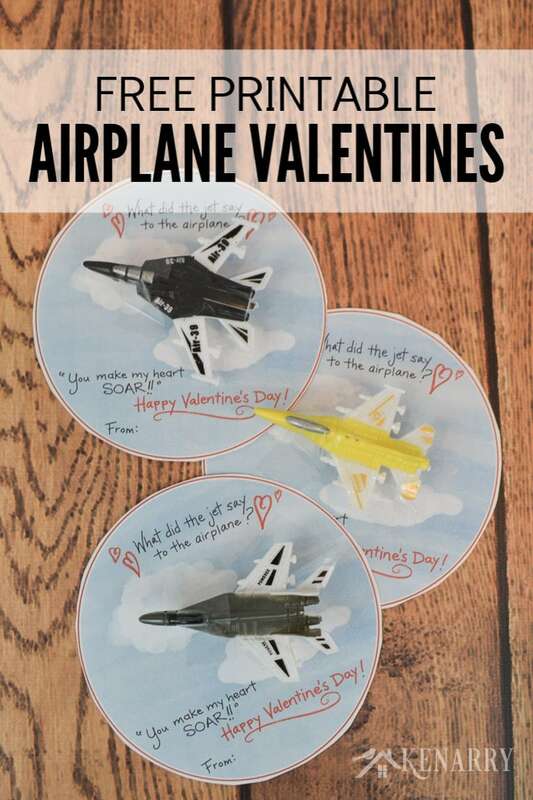 These Airplane Valentine’s Day cards for kids use small toy airplanes or jets as a Valentine’s Day gift that will have your child’s classmates flying with excitement! 1. 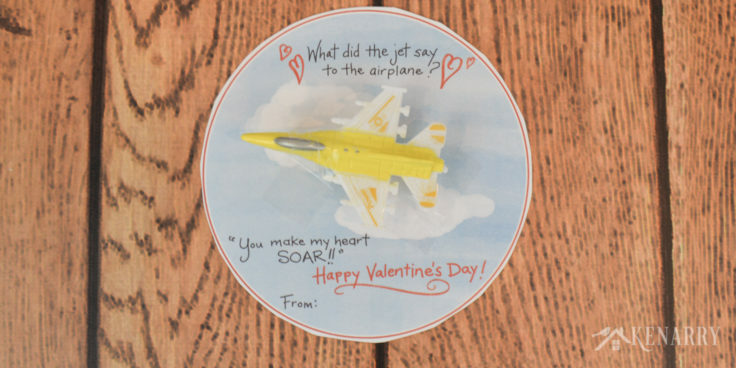 Get the free printable Airplane Valentine’s Day Cards. The printable Airplane Valentine’s Day Cards are available as a FREE gift when you sign up below! Then you just need to download the PDF file and save it to your computer. The Airplane Valentine’s Day Cards and all other free printables from Ideas for the Home by Kenarry™ are for your own PERSONAL USE ONLY. 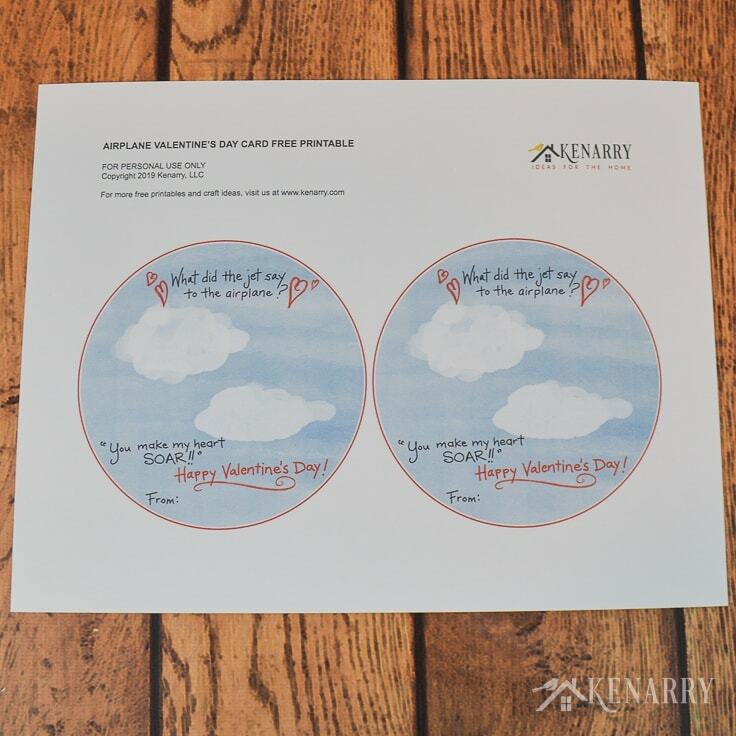 Once you have the file, print the Airplane Valentine’s Day Cards in color on white card stock. 2. 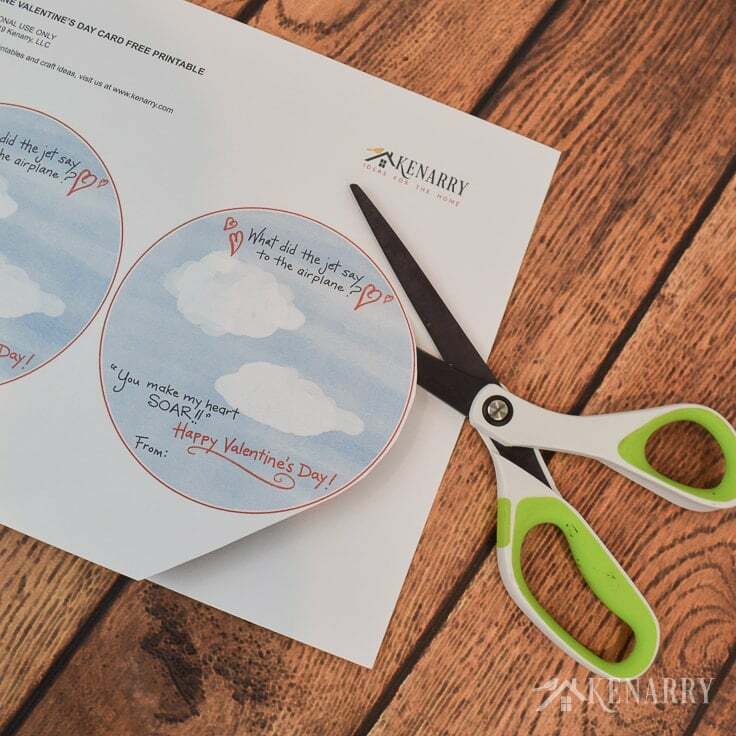 Cut the Airplane Valentine’s Day cards apart. Use scissors to cut the valentine cards apart. If you have kid safe scissors, this could be a good opportunity to have your child practice cutting circles. 3. Sign the Airplane Valentines. 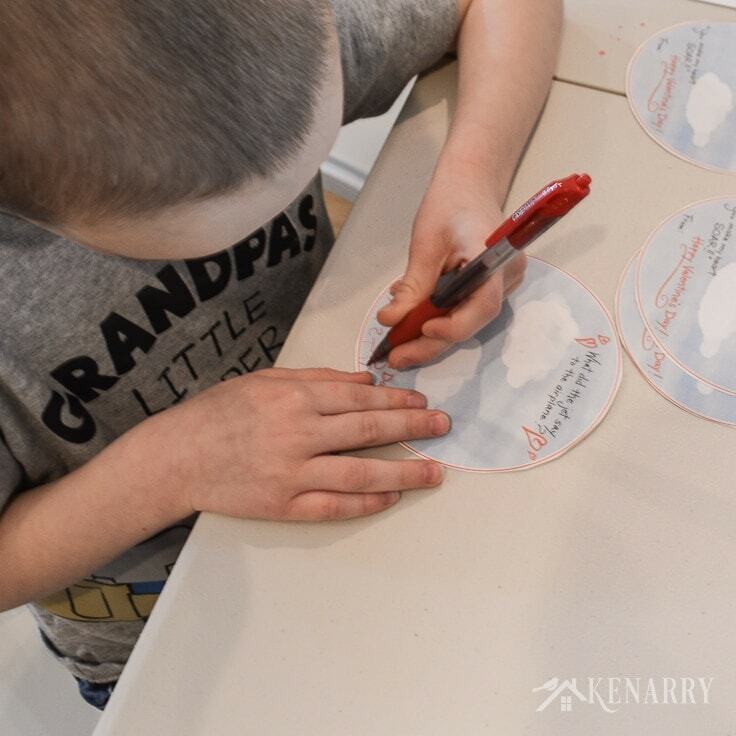 If your child is able to write, have your child spell out his or her name on the Airplane Valentine’s Day Cards. We learned from our older son’s preschool teachers that they usually prefer the kids not address cards to specific kids. Since the kids are just starting to learn to read, it makes the whole distribution process at the Valentine’s Day party go much faster if they can hand the valentine card to any kid. 5. Attach the toy jets or airplanes. 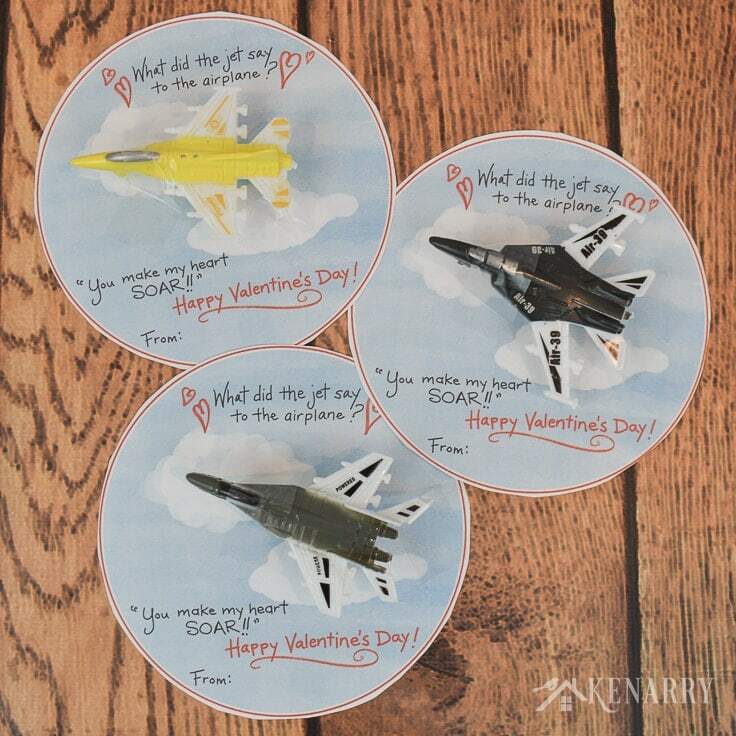 Use transparent tape to affix the toy jets to the front of the Airplane Valentine’s Day Cards. You may have to use more than one piece of tape to make it secure. You don’t want the planes falling off when your child is handing the cards out. Now you have a fun gift for your child to give as valentines at school! What kind of Valentine’s Day cards does your child usually like to give his or her friends? Have you seen any really creative ones? Please comment below and share. We’re always looking for new ideas. While you’re here, be sure to check out the free printable dinosaur treat tags I made for C2’s birthday treats a few years ago. They would totally work as Valentine’s Day cards – you could even attach a toy dinosaur.